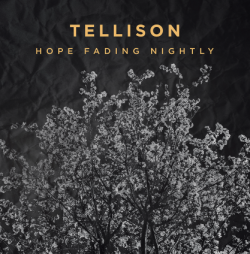 Indie rock act Tellison return with their third album, Hope Fading Nightly on 18th September (through Alcopop! Records). Since their critically acclaimed 2007 debut Contact! Contact! the band have become revered in indie rock circles with their unique blend of instantaneous and infectious rock. That was solidified with their stunning 2011 follow up The Wages Of Fear and while the band may not have had commercial success, they have lived up to the hype, and Hope Fading Nightly is further evidence that Tellison are at the top of their game. Hope Fading Nightly differs slightly from previous Tellison output. It’d be fair to say that it’s not as instantaneous, it’s a grower – you’ll find that some of the tracks that didn’t sit easy on first listen grow and develop into the standout tracks. Lyrically it is darker too, dealing with regret, breakdown in relationships and failure there’s a reflective nature to the album. Yet the upbeat music gives hope and inspiration. ‘Letter To The Team (after another imperfect season)’ is a gentle introduction to the album. A song of lament it’s starkly beautiful. Towards the end it’s laced with hope and has a positive tone. ‘Helix & Ferman’ gets the blood racing and develops into a trademark Tellison track full of hooks and raucous sing along moments – you’ll get shivers as you follow the chants of “Drink Red Wine”. Lead single ‘Boy’ is the first real highlight of Hope Fading Nightly. With its crunching guitars and reflective look back at your first love it has the potential to be a real anthem. Relatable and full of emotional it’s hard not to connect with the track even though it seems to grow on you with each listen. ‘Wrecker’ is one of the times were Hope Fading Nightly is instantaneous on its first listen. It stands out as a brilliant pop rock song on first listen and continues to standout as one of best tracks after multiple listens. ‘Rookie Of The Year’ is the album’s jaw dropping moment. It’s a ridiculously beautiful and catchy song. Dealing with failure to succeed, it is dark and guitar-lite yet the lyrics are clever and peppered with dry wit. It might not hit you on the first listen, but persist as it will engrain itself and you’ll appreciate it for the brilliant song it is. The soaring guitars and chorus of ‘Detective’ get you bouncing, before the raucous energy of ‘Tact Is Dead’ hammers home the fact that this is undoubtedly Tellison’s best work to date. From its quiet introduction ‘Orion’ bursts into life, reflective and racked with a sadness there’s a bittersweet quality that draws you in and makes you fall in love with the track. It’s an exhilarating listen that thrills throughout. ‘Mendokusai’ carries on the same lyrical theme albeit with a rather more relaxed back drop, it still strikes a chord emotionally and again you feel a real connection with the band. ‘Hellhole’ throbs and builds into the infectious chorus before the light and spikey guitars of ‘My Marengo’ act as the perfect antithesis to the lyrics that deal with mourning and recovery. Album closer ‘Tsundoku’ is the kind of track that can draw tears from the listener, the preceding 11 tracks have taken you on an emotional rollercoaster and this is the pinnacle. You leave with a smile on your face. In Hope Fading Nightly you’ll find one 2015’s finest indie rock albums and confirmation that Tellison are one of the UK’s finest and underappreciated rock bands. It is a thrilling listen that connects with the listener emotionally and resonates in both the lyrical content and life affirming music. It gets better and better with each play, essential listening. Album Review: No One Loves You by Blis.